Samantha Cowan is a Compliance Manager on the Security Team at OneLogin, a single sign on and identity management platform. Prior to OneLogin, Samantha was a security engineer at CoverHound / CyberPolicy and Zenefits. In this blog profile, Samantha shares everything from building a federally complaint cloud environment to the role of mentorship in her career. What is your favorite part about working in tech? I love the people in tech. You find such a diverse set of people, from all over the world, from all different backgrounds. This unique diversity makes it even more enjoyable to tackle the puzzles you find at work, because you have all these different ideas coming in from everyone. What is your normal work day like? My days vary quite a lot. I generally spend a fair bit of time collaborating with teams across the company, as well as working with Security and my own Compliance Team to ensure that we continue to drive our program forward. This involves a lot of caffeine and Diet Cokes, a favorite drink of mine. How did you get into technical leadership? I actually started out studying Political Science in undergrad, with the intention of going to Law School. I enjoyed debate because I had found it to be a type of puzzle to solve. However, I soon learned that my love for puzzles wasn’t enough to keep me in that profession. I floated around a number of jobs for a while before going back to complete my undergrad in Liberal Studies. But even at that point, I felt it didn’t provide me the challenge I was looking for. So, while continuing to work full time, I sought out online Masters programs that appealed to me and that I felt would keep me engaged throughout a lifelong career. I came across a dual Masters program from the University of Maryland University College - an MS is Cyber Security and an MBA, and decided to enroll. They were willing to take on a student from a non-technical undergraduate program so long as I was willing to do the extra work to catch up. So I began coursework in Cyber Security, rapidly discovering a love of technology that grew into a love of helping others to succeed in technology and engineering. What do you think is a key ingredient to being a successful engineering leader? Being a team builder and having a genuine drive to see people succeed. What do you look for in a company culture? I look for great people who are smart, diverse and have a drive to help each other do a good job. I think work-life balance is really important, and have found a lot of friends through work, but my philosophy is to work hard, and then be sure to take the ‘you’ time that I think is really important. I follow random feeds on social media and specific news sites. Living in the Bay Area also makes it really easy because tech is a lot of what people talk about, so it makes it easy to keep up. It’s such a huge undertaking to get a cloud environment up and running that is compliant with Federal Government Regulations, and it’s not something a lot of people get the chance to work on - much less lead - from the ground up. What is one of your favorite resources for technical development? Having started out in IT and Security I’ve really had great training from SANS, the most trusted and largest source for information security training in the world. They are expensive but you can also find some amazing online coding and hacking trainings that you can do or practice free of cost. What has been your favorite project that you worked on at OneLogin? Currently, my favorite project at OneLogin has been FedRAMP Readiness and Authorization, a government-wide program that provides a standardized approach to security assessment, authorization, and continuous monitoring for cloud products and services. It’s such a huge undertaking to get a cloud environment up and running that is compliant with Federal Government Regulations, and it’s not something a lot of people get the chance to work on - much less lead - from the ground up. What is the best career/personal advice you’ve ever received? The best advice is to network and not limit who I talk to. I have an amazing mentor - Justin Calmus, my once-again-CSO, who, when I first met him, seriously intimidated me. Now, he’s been instrumental in my current growth and is still helping me plan for the next year or two out. Books really depend on my mood; however...food, I love to talk about...I absolutely love Ramen - Kirimachi in Embarcadero is one of my favorites because the manager knows my dad and me by name. And tacos. Honestly, I just love food. Samantha will be sharing more about her experience at ModelExpand’s upcoming #WomeninTech Breakfast: Candid Talks with Engineering Leaders. 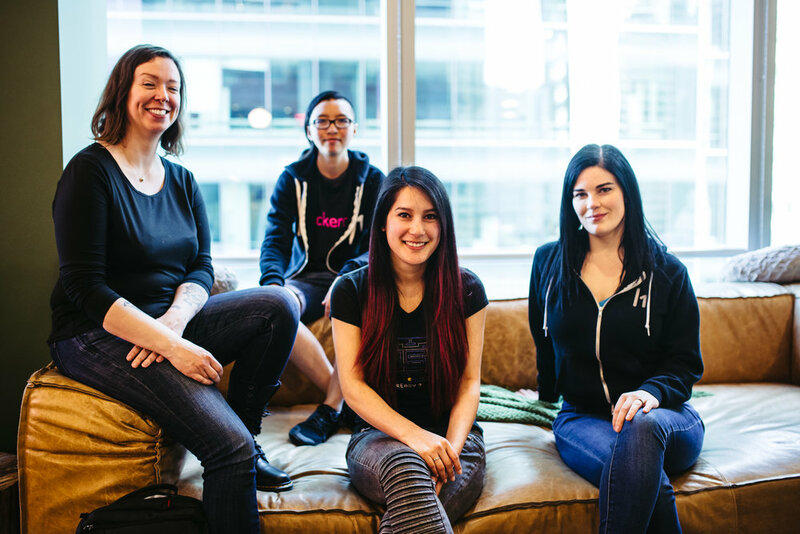 This popular 2019 #WomeninTech Breakfast Series provides a space for company leaders and diverse talent to connect beyond the job post. Check out our upcoming events here or learn more about our sponsorship opportunities. ModelExpand: ModelExpand is a diversity and inclusion advisory firm that helps companies attract and retain diverse talent through strategic consulting, workshops and events.